Why have we decided to make our first headphones by hër as an on-ear version? It’s really quite simple: we wanted to offer the ideal combination of the best sound, high-quality materials and a design that fits with many different looks. are usually delivered with most Smartphones and their small size means that the quality of the sound they deliver is limited. Also, many people don’t like the way the earpiece feels inside the ear, and they are not a very good style statement because you don’t really notice them when they are being worn. cover the whole of the ear. These headphones create an enclosed space around the ear, which shields the ear from surrounding noise and doesn’t let the sound of your music escape into the environment. This makes for very good sound quality but it means that you will have a very large set of headphones, which are more suitable for home use than for wearing when you are on the move. strike a perfect balance: the earphones sit comfortably on the ear, and yet snugly enough to let you forget the world around you. We have expertise from one of the most established manufacturers and wholesalers of sound technology in Europe, and this means that we produce a clear, precise sound that plays back your favourite music exactly as the musicians heard it when they first created it. 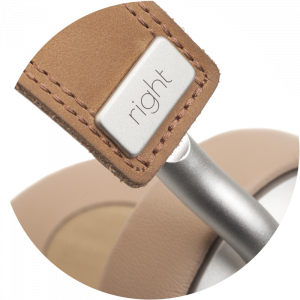 And it can be turned into a beautifully designed product, since we are able to use high-quality materials: metal for the earpiece casing and bracket, soft leather for the headband, and sweat resistant material for the ear cushions, so that they can easily cope with hot weather and workout sessions. lets you enjoy music for hours on end, with maximum freedom of movement. The bracket is designed to be light and easy to wear, and it doesn’t flatten your hair. On-ear headphones are ideal for wearing when you are on the move, because they are easier to carry than over-ears, and quicker to deploy than in-ears, which often have wires that get tangled up. 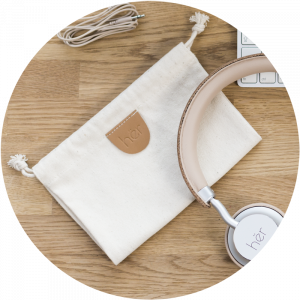 And another thing: our hër headphones come with a smart canvas bag that’s a very attractive item in its own right.